THERE is an almost mischievous look on Terry Butcher’s face as he talks about the full-hearted welcome his new signings have enjoyed on the training pitch. “Even the smallest guy was getting weighed in,” he smiles, recalling the robust challenges and the high intensity session that served as a welcome north for the likes of Daniel Boateng. “They just do that. We demand that from them,” he adds of the Hibs squad and their no-holds barred approach to training. He recognises it is a far cry from the kind of football the young Arsenal player has been used to. 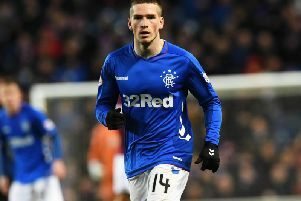 The young defender has been signed on loan from the London club, where he shared the training park with some of the most skilful players in the English top flight and the player, who comes into the reckoning for this weekend’s Scottish Cup tie against Raith Rovers, has quickly sussed that he will have to make some adjustments. “I came into the Arsenal first team against Bolton at 19 and in that squad was Thomas Vermaelen, Yossi Benayoun, Andrei Arshavin, Alex Oxlade-Chamberlain and Per Mertesacker. For Boateng, learning new skills and a different style of play is viewed as a positive. Unfazed by the personnel he has shared the dressing-room with over the past few years, he says he is keen to progress as a player and welcomes the opportunity for regular first-team football, having played just once in Arsene Wenger’s first team, as a late substitute in that League Cup match in 2011. Butcher agrees with him. “He’s a big boy, a powerful lad, good on the ball, got good strength and he is a solid defender. Anyone who can get on Arsenal’s bench is quality. We spoke to a few people down there and they were quite amazed that we got him because a lot of clubs in League One and League Two had wanted him as well, but I think being an ex-England captain helped a bit in the process as well. The reputation of the manager was definitely as much of a lure as the club itself. But he confesses he did need to read up on both before making his decision to see out the season in the SPFL. Seeing the images of his gaffer as a blood-soaked warrior in his playing days simply made the decision easier. “I thought I am a defender myself and he played for England back in the day so I knew he could be of help to myself,” he added.